The Key to Engaging Art Buyers on Instagram: Variety! There are approximately 1 BILLION monthly active users on Instagram, according to recent news articles. Let that sink in for a second. One. Billion. You can bet that out of so many people, some of them are looking for art! The question is: how do you get their attention? The downside to booming activity on Instagram is that with so many accounts posting every minute, it’s easy for your posts to get lost in the shuffle. 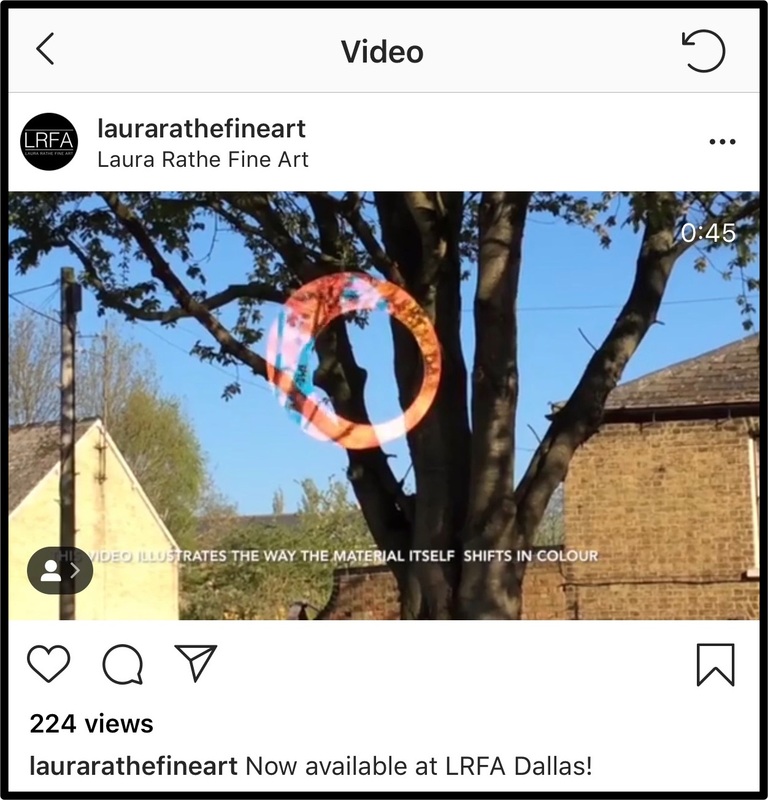 One simple way to stop art buyers mid-scroll on Instagram is to make sure you’re providing them with a variety of engaging content! Sharing an image closely squared in on the artwork itself is never a bad choice. However, if this is what nearly all of your posts look like, you may wind up with a lackluster profile and you will be missing out on a huge opportunity to really help your followers connect with the artwork you’re sharing. Here are just a few ideas for ways to introduce variety in your Instagram posts, and create more in-depth engagement with the artwork you are marketing. Someone who appreciates art will enjoy seeing a little bit more of the work up close! Whether it’s details of luscious paint or close-ups of highly textured artwork, there is so much dimensionality that can get lost when showing just one simple image. Seeing that detail could be just what’s needed to help an art buyer on Instagram get a better sense of the piece. You can also add detail images and include a CTA to swipe through to see the full painting. Curiosity will take over and the more people engage with the post, the more other users will see it as well! It can be so helpful for a client to see a painting styled in an interior or even just hanging on a wall in order to appreciate the scale and presence the artwork has in a space. 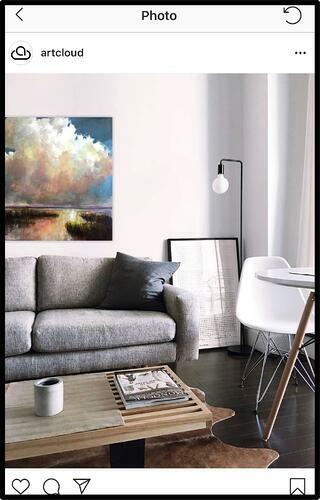 Style a painting by digitally installing it in a space or post installs from happy clients who have purchased art! You’ll be offering helpful suggestions on placement and styling while also making it a little bit easier for clients to visualize the work in their own space. 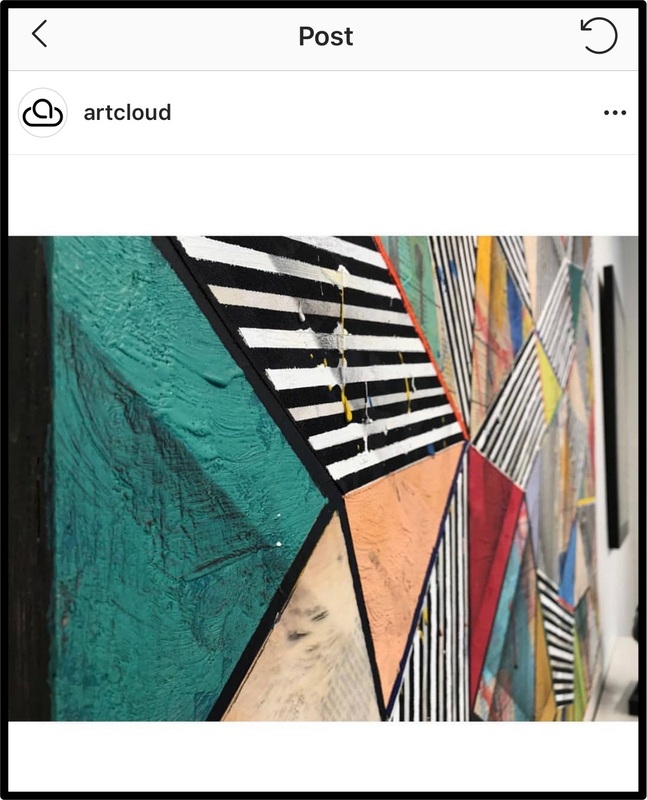 Got the ArtCloud app installed on your smartphone? If so, you can whip up installs with Room View for free! People want to connect with people. 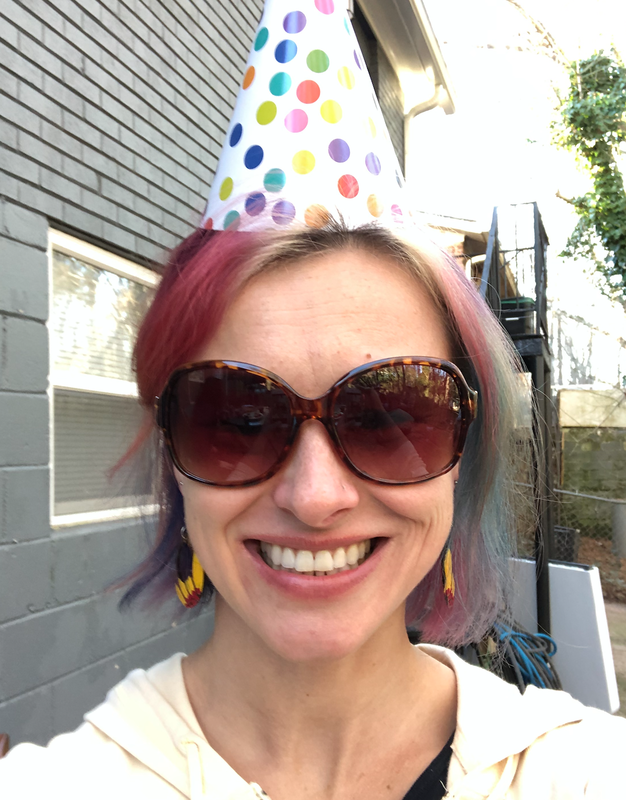 Share a little bit about the people behind your gallery or studio! You can take an image of the team or some behind-the-scenes snaps of gallery life. 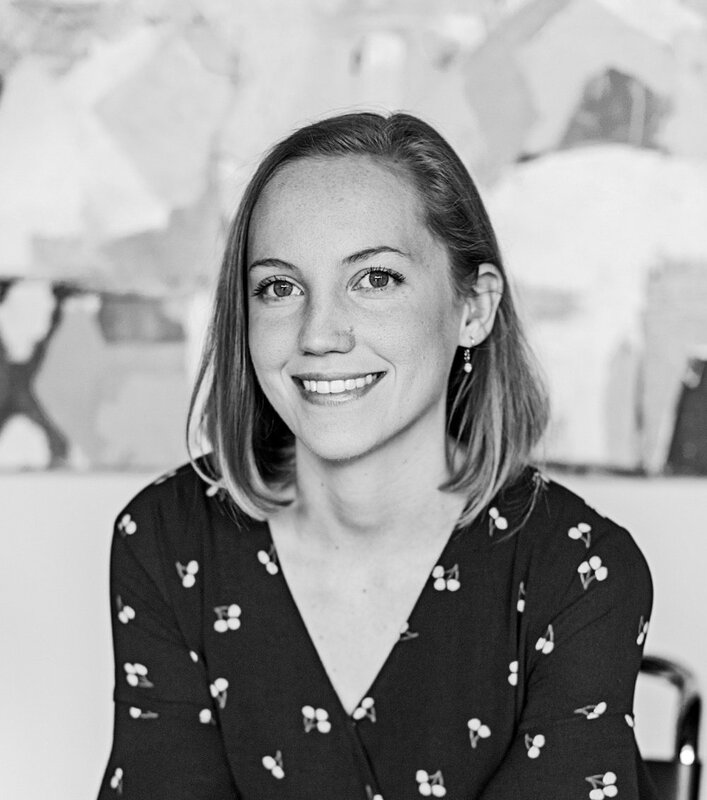 It can help shed a little bit of the mystery and intimidation some people feel when contacting art galleries, and they’ll now have a face to connect with a name when they reach out via phone or email. 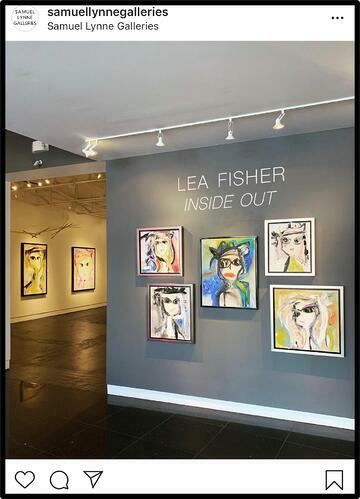 Many art buyers want to invest in the artists as well as the art! 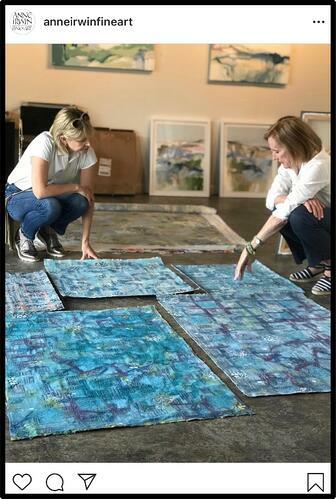 Posting an image of the artist working in the studio or a photo highlighting their process is such a great way to help clients connect further with the artists behind the art. Even if they already loved the work, seeing a glimpse into the person and artistic practice behind the art can add a lot of value. Many artists are on Instagram now as well, so you can use the Repost app to share their images with your followers! This format is still art-focused, but, similarly to installs, shows the work in an environment! You could show you have a large variety by placing a few paper pieces or small works on a floor or table and taking a photo from above. Curating groupings of several pieces and arranging them together in one image is going to stand out on the Instagram feed and provide followers with several options at once. It can even lead to multiple sales! Videos or GIFs are a great way to engage your followers. People will spend more time on your post and that means more time looking at the artwork you are marketing! If you have great lighting indoors, an installation view of what’s in the gallery or studio is always a fun way for people across the world to see your space that may not be able to visit in person. If you have a three-dimensional piece, a video viewing of the work will allow a client to get a sense of scale or movement in the artwork. Again, people want to know they are engaging with other people. Including even a small glimpse of a person in your post can create a connection with the Instagram user. Maybe you’re holding the art in front of you or maybe it’s an image of someone enjoying the work in the gallery! It could even just be your hand included in an image holding a small piece of art. Anything that shows that there is a person behind the screen is a good thing. 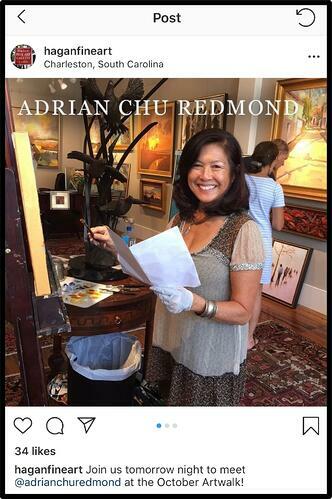 Art buyers will be more likely to comment and start a conversation when they know there is someone there to answer. When it comes to your gallery's Instagram, don’t be afraid to get creative! Mixing things up should be fun for you too and that will be apparent to users who discover your account! Find different ways to highlight what YOU find interesting or love about the art because that’s likely to engage other art lovers as well. Clients will then be learning more about the artwork while simultaneously forming a connection with you as a business!